Canadians worry a lot about protecting their privacy. This issue of LawNow examines some of these concerns. An employer’s right to know about an employee’s medical information and the employee’s right to privacy must be balanced. The challenge with new social developments like privacy is to balance it against other competing social interests like transparency in the legal system. Canadian children have privacy rights under the UN Convention as well as federal and provincial laws. 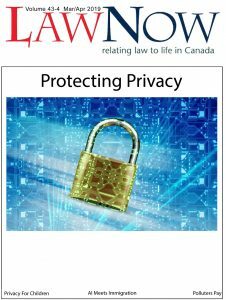 In this case the Supreme Court of Canada addressed the issue of whether and to what extent the sharing of a computer impacts a reasonable expectation of privacy. Canadian immigration law can be complex and confusing. Here is some basic information to help with understanding it. Canada and the U.S. have operated under this Agreement since 2004. The problem is that some refugees no longer consider the U.S. a safe country. The use of artificial intelligence in immigration and refugee decisions may have profound implications for people’s fundamental human rights. President Trump’s so called “Muslin ban” evokes a disturbing history of discrimination in immigration policy that many thought was a thing of the past. Convicted on Sexism: How Does Sexist Reasoning in Favour of the Complainant Work in Today’s #metoo Culture? What is “Self-Dealing” in Employment?